How often do you burn content, maybe pictures, videos, presentations, etc., onto a recordable disc and just store it someplace, never thinking about whether the content is safe or not? Typically you wonâ€™t know until you need to retrieve content from that disc in the future. At that point, it may be too late and the content you thought was safe forever could have been corrupted or it disappeared because you didnâ€™t test the media to make sure whether it was still good quality or not. 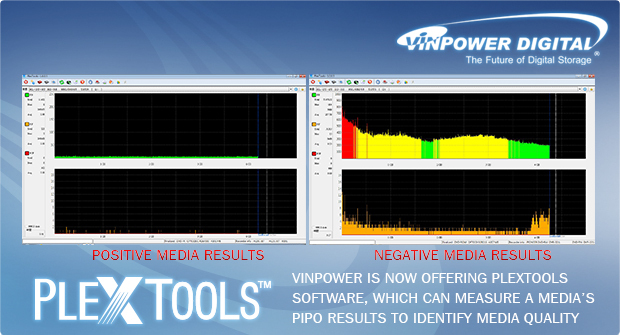 The new PlexTools software from Vinpower Digital, which is available with the retail version of the Plextor PX-891SAF drive, allows the user to gauge whether the media they recorded on is still in good shape or if it is showing signs of deterioration which could result in potential data loss. Using a simple stoplight notification method, if PlexTools shows the media is in the green, then the content is safe and you can continue to safely store that disc to retrieve the content later. If PlexTools shows the media is in the yellow, then itâ€™s recommended to back up the content onto another disc sooner than later to avoid data loss. If PlexTools shows the media is in the red, then you should back-up the content immediately to another disc or a HDD, as the content is in serious jeopardy of being lost if itâ€™s not already. Using PlexTools has a multitude of functionality for testing and reviewing media quality, but most critically, it gives you piece of mind that you can determine with a high degree of certainty whether your recorded content on optical discs are safe or threatened, giving you the opportunity to extend the longevity of your content and your recorded discs. For more details about PlexTools or any of Vinpowerâ€™s duplication hardware or media, visit our website, www.vinpowerdigital.com, or contact a Vinpower representative today.